It was 1973. The Haight-Ashbury was boarded up. The war was virtually over. The things that had spawned radical communities were dissipating. I had exhausted my back-to-nature fantasy by spending some time in Mendocino with a friend who had rented a house deep in the woods. Terry was a painter. I was finishing my second novel. I was also clearing my head after ending the worst relationship of my life. Then it started raining — incessantly. I came back to my place on Masonic Street and Terry ended up near Fillmore and California. There was really no reason to come here in those days. But that’s what gave it its charm. 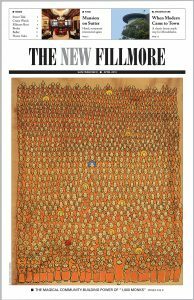 It wasn’t the New Fillmore then. It definitely wasn’t Lower Pacific Heights. 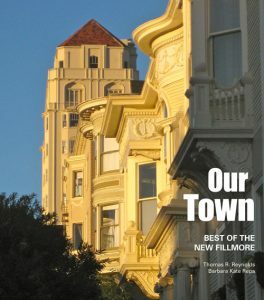 It was an unknown corner of the Fillmore — just some rundown Victorian apartments and a quiet shopping street with a few antique shops and vintage clothing stores that attracted people from Pacific Heights during the day. The neighborhood was mostly black. The rents were cheap. That’s what drew a new tribe of students, painters, novelists, poets, actors and dancers. The community center was the Donut Hole, now Tacobar, on the corner of Fillmore and California. There were coffee shops in the city then, and a couple of cafes in North Beach. That’s where you got something exotic like a cappuccino. Otherwise it was coffee, donuts and sandwiches. Coffee at the Donut Hole cost 21 cents. The Donut Hole had an orange and white interior with glaring overhead lights and a checkerboard floor in black and white. It had Formica tables and padded chairs. For all its simplicity, it was a beehive of interesting conversations with all sorts of people. We’d show up in the morning and talk for a couple of hours before heading off to our private pursuits, then show up again in the afternoon. Hardly anyone seemed to be working. There was a recession underway. I was teaching a fiction writing class one night a week at San Francisco State. Terry collected disability because he had broken his back in the Navy when his truck went over a cliff. He had a painting studio at Fillmore and Sacramento, above what is now Peet’s Coffee. The tall glass windows still reveal what a great setting it was. There was also a heavyset guy named Jim who had stashed some money away and then quit his job to work on his detective novel. There was a psychologist named Al, with a practice on California Street, who would schedule an hour for the Donut Hole just to join us. There was Ron the poet, who would eventually open a bird shop on Fillmore. And Henry, a pale, thin man who always dressed like an undertaker in all black, with dyed black hair pulled back in a ponytail. Henry was in his early 40s, a gay man whose father, a colonel in the Army, sent him a monthly allowance to keep him away from home base. Henry specialized in paintings that imitated Russian Orthodox art, a tribute to his Russian grandmother. There was also a young hippie couple who reopened the Clay Theatre as a second-run art house, featuring double bills of Fellini films or a weeklong Charlie Chaplin festival. They did everything themselves, from sweeping the place to working the ticket window. It was a cold and rainy winter, as winters usually were then. I loved to sink into a long afternoon at a cheap matinee, my legs hooked over the seat in front of me, because there were so few people in the theater. And of course there was Jack, a perpetually out-of-work actor, who had an old fire truck he liked to drive around the neighborhood with a few of us crammed into the front seat. Otherwise it was used for dates and could usually be seen pulled up on the sidewalk near Jack’s flat on Wilmot Street. If the morning table was mostly male, lots of interesting women would show up in the afternoon. There was a modern dance studio up the street, above where Athleta is located now, and the girls would stop by after class. Elin was a young sculptress who lived at the Hard Times Hotel on Steiner Street, a faded blue building with cheap apartments. She created genderless corpses wrapped in gauze that dangled from her ceiling by a hangman’s noose, with tilted heads and subtle smiles. There was a lush sensuality in her morbidity, suggesting something better might lie ahead. 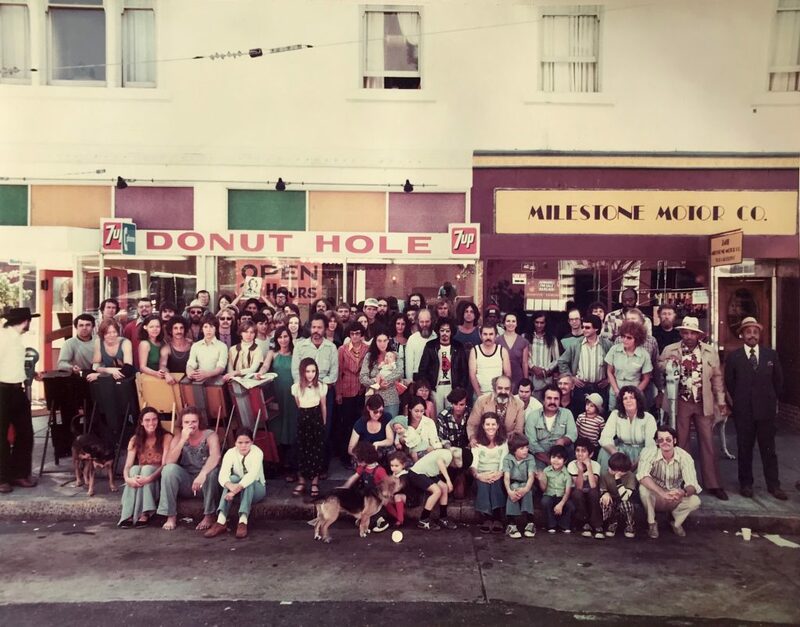 The only celebrity to appear at the Donut Hole was the film star Divine, who showed up for a few days, sat alone by a window with coffee, then disappeared. Women with kids in school would congregate at a table by the window on the California Street side. Linda had five children, but when they all were in school she was free to find an identity outside of her husband and household. She was taking drawing classes and would sit there sketching the Donut Hole crowd. One day I caught her drawing me and waited until she was finished before I went over to introduce myself. I discovered she was well read and we became fast friends. After awhile, I started going to drawing classes with her. Alice was a large, generous, outgoing woman, who usually wore a long denim skirt, a blue work shirt and a cowboy hat. She had a vintage furniture shop on the corner of Fillmore and Pine, now with papered windows but soon to become a new restaurant. Alice was always open for a glass of wine in her flat above the shop after work. Bob and Darlene were living together on California Street, across the street from the Grand Central Market. Darlene was helping raise Bob’s 7-year-old daughter Anya, as well as her own young daughter. When Alice showed up, she and Darlene would inevitably discuss what they were going to make for dinner. Bob seemed bored and read his paper. Before long, he left the table. I’d soon learn that they were on the verge of breaking up. I finally met Bob when he joined Linda and me one day, and soon began to realize the quiet and self-effacing Robert Gonzalez was the most interesting of the lot. He had grown up in Latino neighborhoods in Los Angeles and began winning awards for his painting in high school. He went to art school and then married and had two kids. He made a living creating window displays in department stores in L.A. while he continued to paint, but could find no interest in his work. 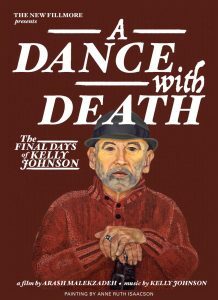 He had one foot in the conventional world and another in living life as a dedicated artist. When he moved to San Francisco, the artist took over. As one of the original founders of Galeria de la Raza, Bob was fully identified with the Latino art movement. His swarthy darkness was made muscular by his days as a star athlete. He had a deep gravelly voice, clouded by too much drink and smoke. He was usually dressed in a straw hat, paint-smeared overalls and sandals, with a red bandana around his neck. On cold days he wore a poncho. When he and Darlene broke up, he took a flat above an empty storefront — now the restaurant Octavia — at Bush and Octavia Streets. He used the storefront as a painting studio. Sometimes he didn’t have the money for canvas, so he painted on paper and cardboard. He was an abstract painter who liked to work in acrylic, watercolor and pencil. He had already had his first one-person show at the Malvina Miller Gallery out on Sacramento Street and a second show was planned. We went to the opening together and I was surprised to learn what a rising star he was and to see all the adulation he received at a small party afterwards. His mention that he wanted to begin adding figurative elements to his painting caused quite a stir. at other times the light’s foliage. better than the children of art? and prisoner of words that flower to nothing. does not want any more poems. But the street rises, it insists! the bird opening his wings! I’d often stop by his studio when my own work was finished and we’d sit and talk for hours. I was devoted to art history, in which he was thoroughly educated. He loved poetry and I was still writing poetry then. On Christmas Eve, I found him in the studio doing a drawing in pencil and acrylic. He’d sold some paintings after his show and the place was stocked with lumber and newly built frames, along with several rolls of canvas. He’d built a couple of solid work tables, scattered with tools, color tubes and brushes. Several paintings in progress stood against a wall and another one sat on an easel. He often worked on several paintings at a time, moving from one to the other, and then back and forth again, for however many days it took to finish each painting. I sat down on an overturned tub and filled a dirty glass from a cheap jug of wine. He was making me a drawing on stiff fiberglass paper, on which several shades of blue and purple were washed over by carmine red. He added a dark stick figure on the right, which might have been a long-necked bird. It also might have been the first time he added anything figurative to a work. I admired the piece, still moist from the paint, and then set it aside. I had already given him a signed copy of my first novel. Minnie’s Can-Do Club was located where Florio is now. Connie’s Soul Food was a few doors down. There was a Goodwill across the street, as well as the New Zion Baptist Church. The long bar in the Can-Do’s front room opened into a back room, where a ping pong table was set up until it was time for the music and dancing to begin. There was a piano in the back room and a jukebox in the front room against the wall. The front room had local paintings along the wall and behind the bar, the most distinct being a portrait of Minnie herself. Minnie was an attractive woman, about 40, who spent most of the night on the end stool near the door while her son and some others tended bar. I’d often pull up on the stool beside her and we’d have a good conversation. When Dave Alexander showed up, the ping pong table was cleared and he’d sit down at the piano to launch his first set of the night. He was a great piano player, backed by a standup bass and a drummer. He played honky-tonk, blues and jazz. On a good night, the bar was packed and the dance floor was full. It was a mix of everybody: gays, straights, mixed couples, blacks, whites and people of many shades. Even Richard Hongisto, the sheriff at the time, was known to stop by. Everybody was loose and friendly and most likely drunk. Everyone was still enjoying that civil rights glow that suggested racism had vanished in the dust of new thinking. After midnight, musicians from all over the city would show up when they finished their gigs and start jamming with Dave. One night Elvin Bishop, who played with the Paul Buttterfield Blues Band, showed up and blew the lid off the place. When things got really hot, Minnie was prone to forget about closing time. It was at Minnie’s that I slowly began to pull away from this sweet little scene, after meeting a woman from Palm Springs who was visiting a mutual friend. It was one of the best relationships of my life, but it never would have begun if it weren’t for that first date at Minnie’s Can-Do Club, when I leaned off my stool in the middle of a sentence and surprised her with a kiss. Peter Vincent is also the author of The Sixties Diary, another neighborhood saga, set in the Haight during the Summer of Love.